When Vicki was here somehow the subject of bacon came up. it’s funny how that can happen. I think we were having breakfast and I mentioned that Boar’s Head pre-cooked bacon is really not that bad. Not as good as on the stove fresh, but very convenient. 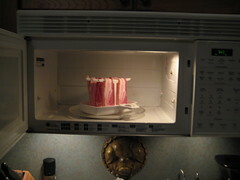 Then Vicki told me about this funny little microwave bacon cooker that the girls had bought Rusty one Christmas. and then we went on with our day. and then the Thank You for the Wonderful Visit present arrived on my front porch. In amongst many wonderful things was Makin Bacon. Vicki oh Vicki ……..
cool gadget ann! but doesn’t bacon grease fly all over your VERY clean micro?? No cover needed? I am so craving a slab of bacon right now! oooh and Lettuce/tomato and mayo!